Whether you have diabetes, insulin resistance, polycystic ovary syndrome or reactive hypoglycemia or simply want to lose weight, keeping your blood sugar levels stable can improve your overall well-being and health. 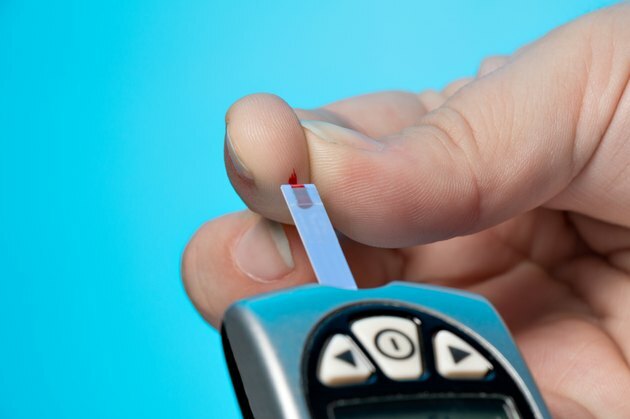 Blood sugar spikes may be associated with fatigue, increased urination, excessive thirst, blurred vision and headaches, although many people do not experience any symptoms at all. Frequent blood sugar spikes can increase your risk for cardiovascular disease, stroke and type II diabetes. Moreover, these spikes often accompany a blood sugar crash, or hypoglycemic event, which can further exacerbate blood sugar fluctuations. Target blood sugar varies based on whether you have diabetes. For people with diabetes, levels below 130 mg/dL are the target before eating, whereas your reading two hours after eating shouldn't go beyond 180 mg/dL. If you do not have diabetes, a target of less than 100 mg/dL before a meal and below 120 mg/dL two hours after eating is more appropriate. A blood sugar spike means that your blood sugar levels go above the desired range. These spikes usually occur in the post-prandial period, or the period after your meal. The main nutrient group that makes your blood sugar spike after a meal is carbohydrates. Carbohydrates include both sugars and starches, which are both converted to sugar, or glucose, when your body digests them in your gastrointestinal tract. If you eat a lot of carbohydrates at one meal, your blood sugar levels will rise to a level higher than they will if you had only a small amount of carbohydrates. Carbohydrates are present in grains, such as bread, rice and pasta; sugar, such as soft drinks, candies and desserts; starchy vegetables, such as french fries, mashed potatoes and corn. You also consume them when you eat fruits, yogurt and milk. High blood sugar levels in the evening are probably related to a high carbohydrate intake at dinner. The carbohydrates you eat are rapidly converted to sugar and can make your blood glucose levels peak in as little as one to two hours, although they can also stay elevated for a longer period of time. Have a look at what you ate for dinner and try to estimate your carbohydrate intake by using food labels and online tracking tools. For example, if you had a burger with french fries and a soft drink, you could easily have consumed more than 150 g of carbohydrates. A large plate of pasta with garlic bread could result in a similarly high carbohydrate intake. The American Diabetes Association recommends that people with diabetes keep their carbohydrate intake between 45 and 60 g at each meal. People without diabetes should aim for about 75 to 110 g per meal, according to the "2010 Dietary Guidelines for Americans." This intake level constitutes a starting point that you should individualize according to your personal needs and tolerance for carbohydrates. Start by counting your carbs. For example, you could have 1 cup of cooked rice with stir-fried broccoli and chicken, or 1 cup of cooked whole grain pasta with tomato sauce, ground meat and a salad of leafy greens, or 3/4 cup of mashed sweet potatoes with a serving of salmon and asparagus for a total of 45 g of carbohydrates each. Check your blood sugar levels before eating and then one and two hours after your meal to see how 45 g of carbohydrates influence your blood sugar levels. If your blood sugar levels are within the target, you have found your optimal carb intake. If you still have a peak, reduce your carb intake to 30 g or 15 g the next day. If you take medications or insulin to control your blood sugar levels, consult your doctor before adjusting your carbohydrate intake.